Lakshmi (born Yaragudipati Venkatalakshmi on 13 December 1952) is an Indian actress known for her work in the Indian film industry. She made her film debut through a Tamil film Sri Valli. Her debut in Tamil film as an actress was with Jeevanaamsam (1968) and in Telugu film was with Bandhavyalu (1968). In 1974, Her second Malayalam film, Chattakari, which went on to become a blockbuster throughout India. She then went on to appear in a number of commercially successful films in Tamil, Kannada, Malayalam, Telugu and various other languages. She has won one National Film Award for Best Actress, nine Filmfare Awards South, three Nandi Awards, Kerala State Film Award for Best Actress, Karnataka State Award for Best Actress for the movie Hoovu-Hannu, the Bengal Film Journalists Association Awards and various other state awards. Lakshmi made her Bollywood debut in 1975, with the woman-centric Julie, the remake of Malayalam film Chattakkari. After appearing as a lead actress for more than a decade, she switched over to character roles. Lakshmi was born and brought up in Chennai, Tamil Nadu, to veteran Telugu film maker Yaragudipati Varada Rao of Nellore, Andhra Pradesh, whose films dealt with important social issues. Her mother Kumari Rukmini was a Tamil actress. She established herself as a successful and popular actress in South India in the 1970s, acting in all four South Indian languages: Tamil, Telugu, Malayalam and Kannada. Lakshmi rose to fame with her first Malayalam movie Chattakari (1974), which won her the Kerala State Film Award for Best Actress. This has the distinction of being the first Malayalam film to run continuously for 40 weeks in a Bangalore theatre. Chattakari (1974) was remade in Hindi as Julie (1975) and in Telugu as Miss Julie Prema Katha (1975). In addition to a Filmfare Best Actress Award, she also won the Bengal Film Journalists' Association Awards for the "most outstanding work of the year", for her work in Julie. She is known for her versatility as an actress and for the glamorous outlook she embodied. Her acting in the Telugu film Panthulamma is often credited as one of her best performances. After the success of her debut Malayalam film Chattakari, she starred in many other films in Malayalam. She won Filmfare Awards for Best Actress for her performances in Chalanum and Mohiniyaattam. She has acted with almost all the leading actors and stars of South India, but it was her combination with the popular actor Anant Nag in the 70s and 80s that struck a chord with the audience. Nag and Lakshmi are considered one of the all-time greatest pairs in South Indian cinema. They acted together in more than 25 films. Their pair was considered the right recipe for success. Most of the films based on TaRaSu novels were based on the life of young middle class couples. After her success in Julie, however, Lakshmi didn't star in many Hindi films and instead concentrated on doing more South Indian films. 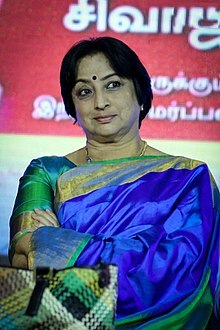 She won the National Film Award for Best Actress for Sila Nerangalil Sila Manithargal (1977), becoming one of the first South Indian actresses to win that category for a Tamil film. When her career as a leading lady ended in the 1980s, she started playing supporting roles as a mother and later as grandmother. She played Aishwarya Rai's grandmother in Jeans (1998) and Kareena Kapoor's grandmother in Hulchul (2004). She has performed in more than 400 films and has also been involved in politics. Under K. Balachander's supervision, she made her directorial debut with a remake of Yours, Mine and Ours: the Kannada film Makkala Sainya (1980 Tamil version Mazhalai Pattalam). Lakshmi is fluent in all four South Indian languages. She took a break from acting to host two talk shows, including the Tamil talk show Achamillai, Achamillai.She hosted a talk show in Kannada for Suvarna channel called Idu Kathe Alla Jeevana. She also hosts a talk show in Tamil for Vijay TV called Kadhai Alla Nijam. She has hosted a talk show in Kannada for Suvarna channel called Neena? Naana? After the shows ended, she returned to act in films. Currently she is on the judges' panel for the Malayalam reality show Champions on Surya TV. She is also a judge for a Kannada reality show called Drama Juniors on Zee Kannada. Her first marriage was to Bhaskar in 1969, who worked with an insurance company. The couple have a daughter, Aishwarya, born in 1971. Lakshmi divorced Bhaskar in 1974. She fell in love with her co-star Mohan Sharma on the sets of Chattakari and got married in 1975, but it ended up in divorce in 1980. While she was shooting En Uyir Kannamma, she and actor-director M. Sivachandran fell in love and got married in 1987. The couple adopted a girl named Samyuktha in 2001. In order of languages in which she acted in the most to least number of films. ^ Lakshmi (12 March 2016). Weekend with Ramesh Season 2 - Episode 23 - March 12, 2016 - Full Episode (in Kannada). Zee Kannada. Event occurs at 4:50. Retrieved 13 March 2016. ^ "Sri Valli—1945". The Hindu. Chennai, India. 28 December 2007. Retrieved 22 July 2009. ^ "69th & 70th Annual Hero Honda BFJA Awards 2007". Archived from the original on 19 January 2008. Retrieved 12 August 2016. ^ "KB: Kollywood's Discovery Channel". 3 January 2015. Retrieved 12 August 2016 – via The Hindu. ^ Sathyendran, Nita (23 January 2009). "Timeless, ageless". The Hindu. Chennai, India. Retrieved 22 July 2009. ^ Warrier, Shobha (3 March 2001). "'I don't want to act with half-baked idiots any longer'". Rediff. Retrieved 22 July 2009. ^ ""I'll act till my last breath" - Lakshmi". Screen. 27 July 2007. Retrieved 22 July 2009. ^ "39th Annual BFJA Awards". BFJA. Archived from the original on 19 January 2008. Retrieved 2012-01-06.